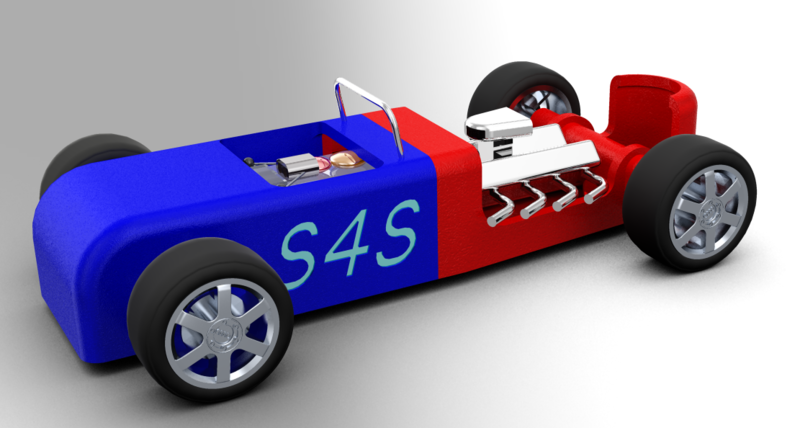 This hot rod model uses the Scalextric4Schools parts pack and is designed to be 3D printed. There are three RP parts in the PTC Creo design; the rear body (blue), front body (red) and V8 engine (chrome). You will probably use a single colour for both body parts and maybe black or white for the engine. Building the blue body piece upside down and the red body piece right way up should minimise support material. The V8 engine will need support material for the exhausts whichever way it's built. The windshield frame can be made from 1mm wire e.g.a paper clip. Hold large white contrate pinion inside the rear body (blue), pass the rear axle through the hole in the side of the body into the contrate and out the other side. Make sure the contrate covers the splines in the middle of the rear axle. Press the small white pinion, shoulder towards the motor, onto the end of the motor spindle to cover the splines. Offer the motor into the rear body to mesh with the contrate gear on the rear axle. Use superglue to fix the Red front body into the rear body capturing the motor. Solder wires to the small metal contacts. Offer the pick up into the front body (red) from below. Screw the small black screw into the pickup from above so the pickup revolves freely – DON’T OVER TIGHTEN the screw! Feed the wires through the holes in the bulkhead at the back of the front body and solder to the motor terminals. Pass the front axle through the obround slot in the front body and attach wheels. Front axle must be free to rotate and slide up and down in the slot. Press wheels onto the rear axle. Bend and cut a paper clip to fit into the holes for the windshield frame. Thanks Dan. I really enjoyed modelling it even though it was a rush job for a family day event. It is designed to minimise support material and be easy to assemble. The 3D printer is busy building it as I type, I'll let everyone know how it comes out. 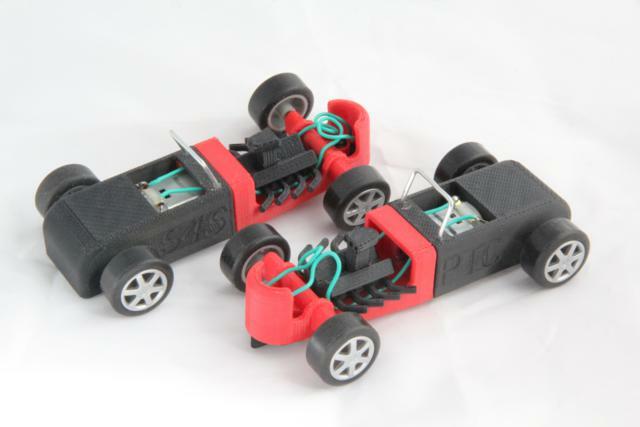 Here is a photo of the finished cars.